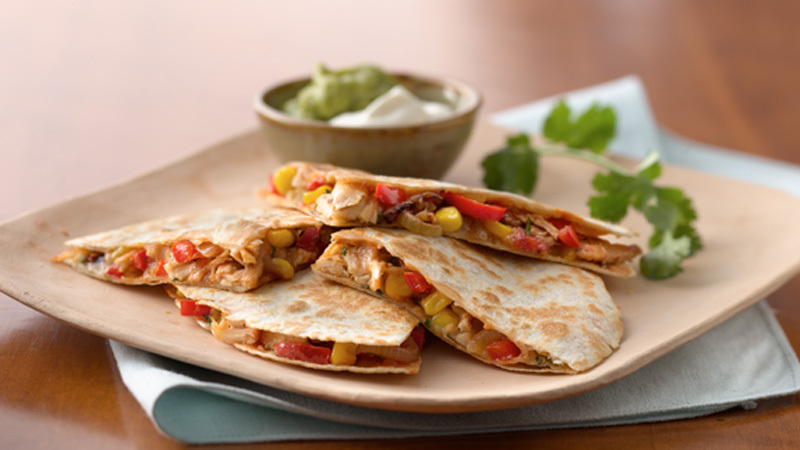 Old El Paso™ salsa and tortillas provide a simple addition to homemade chicken quesadillas that are ready in 35 minutes. Perfect if you love Mexican cuisine. 1. In a 25c m nonstick frying pan, heat 1 tablespoon of the oil over medium-high heat. Add the pepper, onion and corn; cook, stirring occasionally for 4 to 5 minutes or until pepper and onion is softened. Remove from heat and stir in chicken, cheese, chipotle sauce and coriander. Wipe pan clean. 2. Brush one side of each tortilla with remaining 2 tablespoons oil. With 1 tortilla, oiled side down, into pan. Spread 2 tablespoons salsa onto tortilla. Spoon about 1/3 of the chicken mixture onto tortilla; top with another tortilla, oiled side up. 3. Cook the tortilla in the pan over medium-high heat for 1 to 2 minutes on each side or until the tortilla is golden and cheese is melted. Repeat with remaining tortillas, salsa and chicken mixture. Cut each quesadilla into wedges to serve. Great served with guacamole and soured cream.